Russian Video: Crocodile Gena (cartoon)! Today we are watching one of the best and most famous Soviet cartoons Crocodile Gena, 1969. This cartoon was bought and translated in Japanese and Finnish and now we can watch it with English subtitles. Crocodile Gena works as a crocodile in the Zoo and tired to stay always by himself. 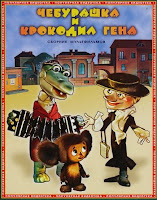 So he decided to find friends and soon Crocodile Gena meets a girl Galya and Cheburashka. If you want to understand Russians these cartoon must be watched. And Crocodile Gena is an excellent cartoon to watch with your kids. Who likes the “Crocodile Gena” cartoon click “Cheburashka” to watch the second part! Cartoon is made by Eduard Uspensky book, by director Roman Kachanov. This entry was posted in Cartoons on August 7, 2009 by admin. Pingback: How to say Happy Birthday in Russian!